Helena Norberg-Hodge "The Economics of Happiness"
In January, the ISD welcomed Helena Norberg-Hodge back to the Great Hall for a special NYC screening of "The Economics of Happiness," a documentary about the worldwide movement for localization. 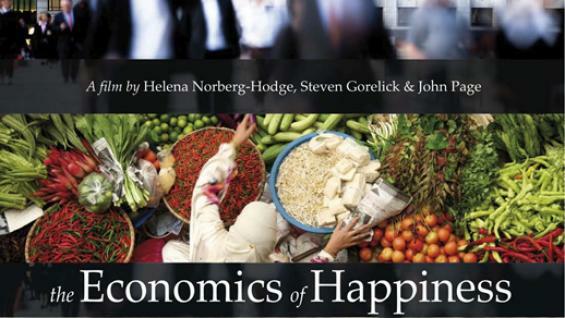 Last spring, Helena Norberg-Hodge delivered a compelling lecture, which highlighted the psychological, social and ecological benefits of economic localizvation and presented clips from the rough-cut of 'The Economics of Happiness'. This time, the feature-length film had its East Coast premiere in the Great Hall, followed by a panel discussion with the director and special guests including Judy Wicks and Gloria Steinem. The film features a chorus of voices from six continents calling for systemic economic change, including David Korten, Bill McKibben, Vandana Shiva, Rob Hopkins, Richard, Heinberg, Juliet Schor, Michael Shuman, Helena Norberg-Hodge, and Samdhong Rinpoche - the Prime Minister of Tibet's government in exile.